A compound butter flavored with maple, orange, rosemary and garlic is massaged into the skin of a brined turkey. This recipe gives you three options for cooking: oven roasting, grilling or the rotisserie method. A brined turkey takes an extra day to prepare, but the end result is well worth the effort because the meat will have a better flavor and be moister than that of a turkey that has not been brined. For Brine: Combine all brine ingredients, except turkey, in large pot and simmer over low heat for 1 hour. Chill brine in ice bath until cold. Place whole turkey into foodservice-safe grade container. Pour chilled brine over top to submerge. Close bag and cover. Marinate for 24 hours in the refrigerator. Remove turkey from brine, drain excess liquid. Place vegetables and herbs in body cavity and secure. For Compound Butter: Combine butter, orange juice, salt, pepper, maple syrup, rosemary, thyme and garlic in a large bowl. With fingers, slowly massage the compound butter into the skin of the turkey until well absorbed. Fold wings under the back of the turkey and return legs to the tucked position. 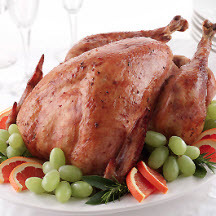 Turkey may be cooked in a 325°F (160°C) to 350°F (175°C) oven or on a rotisserie. 170°F (approximately 75°C) in the breast and 180°F (approximately 80°C) in the thigh. even balance. Place a drip pan in the center of the grill beneath the area where the turkey juices will drip. Cook the turkey over indirect medium heat in a covered rotisserie. If cooking with charcoal, replenish briquettes with about 15 briquettes every hour, as needed, to maintain medium heat. Cook until the internal temperature of the turkey reaches 170° F (approximately 75°C) in the breast and 180°F (approximately 80°C) in the thigh (about 3 hours). Allow turkey to rest for about 15 minutes. Remove vegetables and herbs from the cavity prior to carving. Place slices on a platter and garnish with oranges. Recipe and photograph provided courtesy of the National Turkey Federation and Marc Van Steyn, Executive Chef at Rigsby's Cuisine Volatile in Columbus, OH, and Honeysuckle White, a division of Cargill, Incorporated. Used with permission.